Outdoor weddings can take place at an elegant country club, lakeside, or a grassy field, but the beach is perhaps the most scenic place to exchange nuptials. Beach weddings continue to increase in popularity due to their affordability and natural beauty element— nothing compares to a sunset background with the tide of the waves rolling in and the feel of the soft sand beneath your feet. So bask in the sun and relax because The Manor has expert wedding planning tips for what brides need to know when planning a beach wedding. The most prominent benefit of hosting a beach wedding is the price, which allows couples to comfortably stay within budget by leveraging a natural and beautiful setting. Beach weddings offer an enjoyable mini-vacation for the bridal party and guests. In addition, consider looking for special wedding packages in your area, which can include photography, florists, canopy rentals, and even filing for a marriage license. Unlike indoor weddings, you must consider all possible weather outcomes for beach weddings. When planning your outdoor wedding, pick your beach location according to the weather, coves and other protected areas help to shield your guests from unpredictable wind. Another factor to keep in mind includes proximity to the shore, as the tides ebb and flow. To prepare for inclimate weather like unforeseen rain, be sure to rent an outdoor canopy as a precaution. Canopies prevent seagulls and other birds from invading your reception area and offer space to decorate according to your theme. Before selecting the location, confirm with authorities if the space requires a special permit. Small weddings usually do not require any special permit. Also, keep in mind that public beaches do not always allow set up prior to the ceremony, alas, guests may have to grab their own chairs as they arrive. Furthermore, inquire about noise ordinances, as crowds flock to beaches during the summer months. While dancing in the sand has its perks, sandy beaches make walking in dress shoes difficult therefore, being barefoot on the beach is always acceptable. Consider providing a place for guests to take their shoes off or give out flip-flops in varied sizes for guests. The bride may be comfortable with flat sole sandals or wedges to avoid sinking in the sand. A more casual approach to wedding attire is best fitting for beach wedding. Brides may choose to wear a flowy, more relaxed wedding gown of any length, or style. Similarly, the groom and his men typically wear button down shirts in a lightweight fabric. Typical color choices for a beach wedding include whites, beiges, or light pastel colors with khaki pants. The light and airy atmosphere of the beach allows for a wide array of comfortable clothing options. From floral arrangements and centerpieces to table linens, beach wedding decorations should remain simplistic and elegant. Couples do not need to have lavish décor as the natural ocean backdrop and sunset provide the main focus. To carry the beach theme throughout the wedding, you can include an assortment of seashells, seahorses, sand dollars, and romantic candles; etch your monogram and wedding date to double as guest favors. 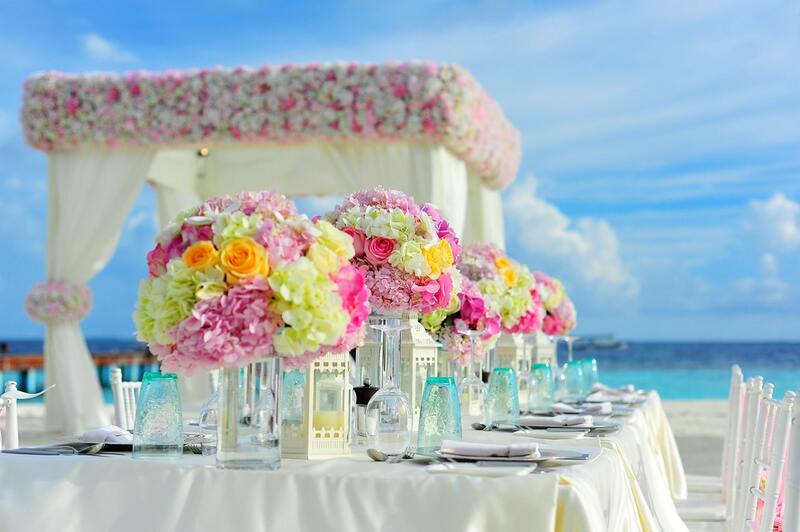 When selecting floral arrangements or table linens include warm and bright color palettes of turquoise, coral, lilac, or canary yellow; colors that contrast the sand and the surf. In addition, choose a photographer that has experience shooting beach weddings and exceptional timing to capture that golden hour before sunrise or sunset. Beach weddings offer many benefits whether you choose your local beach or a destination wedding. Planning your beach wedding can breeze with proper planning. The beach sounds, smells, break taking view and shared love, will be a dream come true. Contact The Manor to help you plan your ideal beach wedding. This entry was posted on Wednesday, July 26th, 2017 at 3:50 pm	and is filed under Beach Wedding, Wedding Attire, Wedding Locations. You can follow any responses to this entry through the RSS 2.0 feed. Both comments and pings are currently closed.